Cheryl Harness uses her wonderfully vibrant art and down-to-earth writing style to "chip away the marble" and present George Washington as more than a monument. We see George the adventurous boy, tromping through the woods with his dog and his hunting rifle; George the courageous military leader fighting alongside his men; George the cunning military strategist, outfoxing the British and forcing their surrender at Yorktown; George the brilliant statesman presiding over the Constitutional Convention; and George the President, wisely protecting our country from enemies foreign and domestic so it could grow strong. 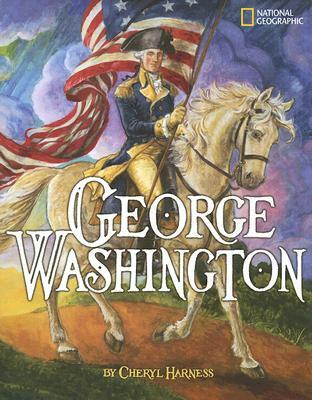 George Washington is recommended reading in Illuminations Home School Curriculum. Cheryl Harness uses her wonderfully vibrant art and down-to-earth writing style to "chip away the marble" and present George Washington as more than a monument. We see George the adventurous boy, tromping through the woods with his dog and his hunting rifle; George the courageous military leader fighting alongside his men; George the cunning military strategist, outfoxing the British and forcing their surrender at Yorktown; George the brilliant statesman presiding over the Constitutional Convention; and George the President, wisely protecting our country from enemies foreign and domestic so it could grow strong. But through it all, we see George as happiest living as an experimental farmer at Mount Vernon with his wife, Martha. He could have been Emperor of America, but he chose to spend his last years "looking after things that needed doing" at home.